I wrote in detail about Tedford's firing in a recent article. Tedford, the winningest coach in school history, just wasn't keeping up in a Pac-12 that is quickly evolving. The conference is now home to powerhouses like Stanford and Oregon (and to a lesser extent USC), just added Rich Rodriguez, Mike Leach, a resurgent Jim Mora, and Todd Graham to the roster of coaches. Kyle Whittingham has completed an undefeated season at Utah just a few years ago. Jeff Tedford, in the span of just a year or two, had the stench of obscurity. Worse, the performance on the field reflected it to an extent. Heck, there's even an argument to be made that it improved. Despite losing media attention to Stanford and Oregon in recent years, Cal was still recruiting at a pretty impressive level. There's certainly enough talent on-hand to win half the games on the schedule. Cal only got halfway to that mark in 2012. At first glance, the offenses don't look that impressive, but the Y axis extends a little farther than average because of the 2012 season. Dykes was outstanding as Tech's OC in 2005 and 2006. Granted, Mike Leach was probably calling a lot of plays, but Dykes learned the Air Raid and played an important part in gameplanning. In 2007 he joined Mike Stoops in Arizona as OC for the Wildcats. The first year, like most with the introduction of the Air Raid, was not particularly efficient. The Wildcats exploded offensively in year two and were good once again in 2009. At that point, Dykes was hired in Ruston. For the first two years, the offense, as he built it from scratch, was solid but not stellar. In 2010 the defense was atrocious, and the Bulldogs went 5-7. The offense slipped slightly in '11, but vast defensive improvements (a net gain of around 165 points) led to an 8-5 breakthrough for LTU. 2012 saw the defense regress in a worrisome way, but it might be linked to the absurd offensive display the Bulldogs managed. 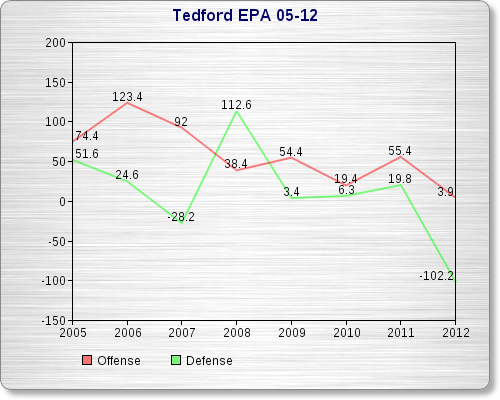 Yes, they lost 230 EPA on defense, but still came out with net gains, thanks to a 240 EPA improvement on offense. As mentioned earlier, the offense currently leads the country in Expected Points Added. It's reasonable to think great offenses make things hard on defenses. Think about it this way - great offenses score points and build leads. Trailing teams typically pass more. Teams that pass a lot typically can put up more impressive offensive totals. Perhaps more research should be done on this matter to see if high offensive EPAs correlate with poor defensive EPAs. Even considering the freefall on defense in the graph above, it's hard not to be excited about the addition of Dykes to the list of Pac-12 offensive geniuses. 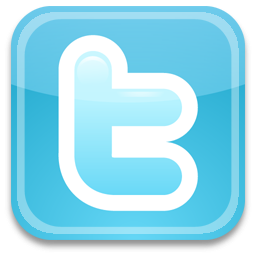 One area that causes a bit of concern is the recruiting arena. 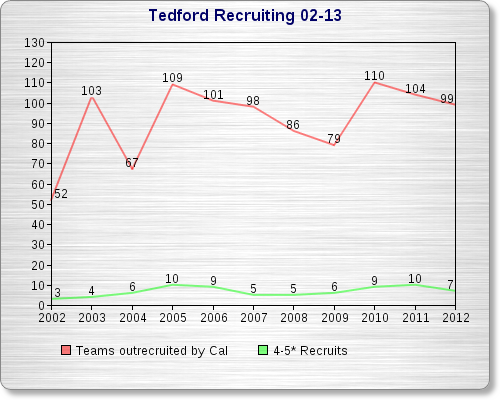 Jeff Tedford, despite his inability to produce on-field results over the last few years, still recruited pretty well. Shown in the graph above is Louisiana Tech's recruiting from 2007-2009, the three years before Sonny Dykes' arrival, and 2010-2013, the Dykes tenure. 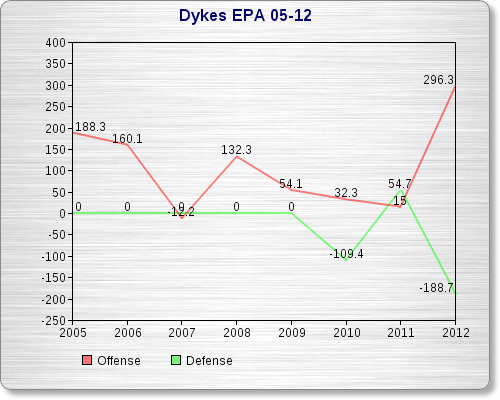 Despite more success on the field than they enjoyed under Derek Dooley, Dykes hasn't recruited quite as well. Even if you say such differences in recruiting classes are negligible - and it's a fair argument - Dykes definitely didn't improve the recruiting in Ruston. If Cal fans have any reservations, it should be in regard to his recruiting ability, where he is an unproven commodity. That being said, Cal fans should be pretty excited about this hire. Mike Stoops coached 91 games in Arizona and went 41-50. Dykes was in the desert for just 38 games, and while there helped Arizona to 21 wins. In more direct terms, the team was 21-17 with Dykes, and 20-33 without. 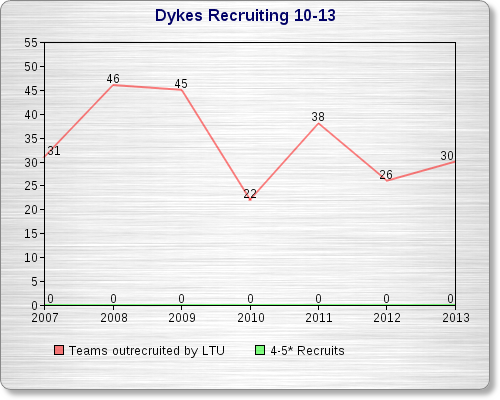 When Dykes started at Louisiana Tech, they were coming off a 4-8 season. Derek Dooley went 17-20 from 2007-2009. Dykes has gone 22-15, with the team improving its record every single year. Cal may have growing pains under Dykes. 2013 is unlikely to be a quick turnaround, if history shows us anything. However, there's no reason to think Cal won't be back in contention for the Pac-12 North as early as 2014. Dykes was a hot name on the coaching circuit for close to a year now. The Golden Bears are about to find out why.